We are a small and friendly family-run school based in Wimbledon, London. The school was started by my mother in 1975 and I took over 14 years ago, having worked alongside her for many years. I am passionate about education and love the stimulation and reward of helping children to succeed in learning English. As a mother of two young children myself, I have a good understanding of the needs of children, as well as the concerns of parents. At the Summer School of English we work hard to provide a safe, happy and stimulating environment for all our students. Our course provides a comprehensive and well-balanced programme through which students develop their command of the English language. All our teachers are qualified and experienced. In addition to classes we also offer an exciting range of excursions to museums, historic palaces, major tourist attractions and activities such as football, bowling and tennis. For the older students we can organise accommodation with carefully selected host families. 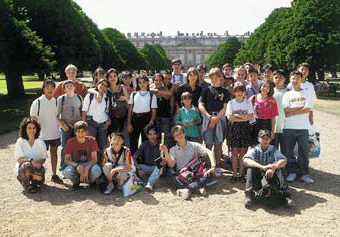 One of the unique characteristics of our school is the exciting mix of nationalities. We don’t take large groups of students from any one country or school thus ensuring a truly cosmopolitan and friendly learning environment. Please have a look at our website and do not hesitate to contact me if you have any questions or if you would like any further information. I look forward to hearing from you.